Clibu lets you collect information in one place, access it from anywhere and share it with whoever you want. When you want to assemble information from various sources, but primarily from content you have found on the Web, you need a way to save it, identify it and easily access it at a later time. This is the beauty of Clibu - don’t bother with next-to-useless Bookmarks, or unconnected Word™ and HTML files. And Clibu has the wherewithal should you want to share & collaborate on your research project with colleagues, friends or family. Use your time more productively with Clibu and overcome the deficiencies and frustrations of inadequate alternatives. Add content to Clibu via its Web Clipper. Copy and Paste text and images from other applications. Email content directly into Clibu. Collect information in a central database, edit it and add notes and quickly find it again. Nominate your own ‘Knowledge Bases’ for overarching topics. Utilize hierarchical tags for articles and add links to related articles. Also retrieve information via tags and related links. Access and work on your information from anywhere in the world. 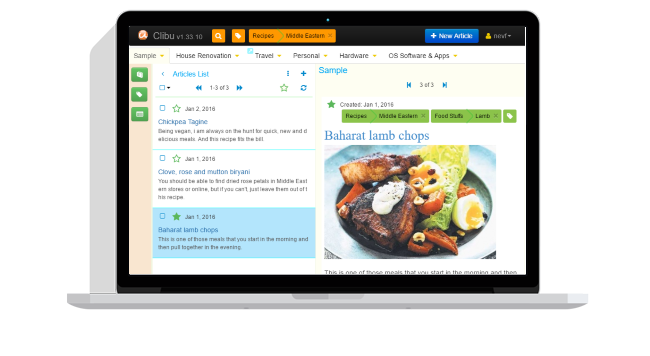 Create great looking, easy to read articles with Clibu’s rich text editor. Link related articles to each other. Use the ‘Table of Contents’ to quickly move around articles. Your data belongs to you. Privacy is assured. Your data doesn’t have to be locked away out of your reach and control. Clibu gives you the option to install and run it on your local PC or server. Or use our cloud hosted service, where each user gets their own database, which only they can access (unless they choose to invite other individuals…). With Clibu it’s a breeze to share content with chosen colleagues and friends. You can also permit them to collaborate, with full edit access, rather than ‘view only’ access. Sharing and collaborating is available on a Knowledge Base by Knowledge Base level. Clibu pushes updates as they occur, out to all users on all devices no matter where they are. This is far superior to other applications that use clumsy unreliable synchronization to acquire up to date content. Clibu works on Desktop PC’s, Tablets and Smartphones. With the same consistent User Interface. Using any Operating System with a modern Web Browser. Clibu is backed by first class, timely support. By using latest and best Web technologies Clibu aims to deliver a great user experience. And it just keeps getting better with a steady stream of new releases. A navigation bar with Search, Tags filtering, a button to create New Articles and a User menu. A Tab bar to work with multiple notebooks. A collapsible panel to create, open, rename Notebooks, or as we call them Knowledge Bases. 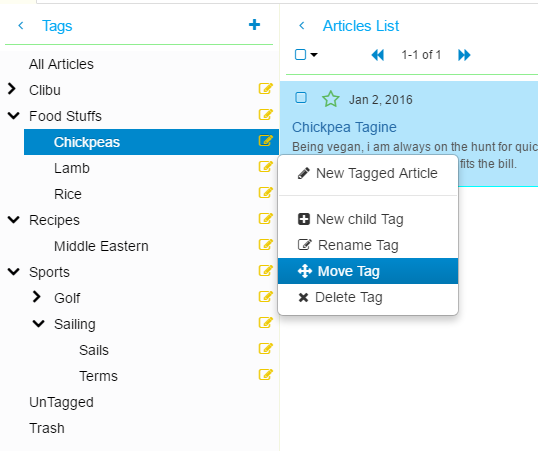 A collapsible Tags Tree panel to create, select, rename and move Tags. 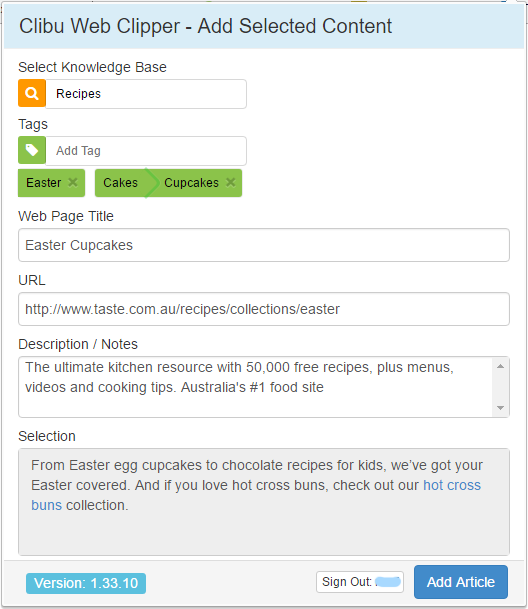 Clibu’s Tags can be nested, allowing true hierarchical content organization. A collapsible Articles List which shows a summary of the articles matching the current query. An Article panel showing the currently selected article in full, its tags and date created. Articles are edited here using our rich text editor. Quick and easy information gathering is key to making a product like Clibu one you don’t hesitate to use. Clibu provides several ways to acquire information. The first shown here, is the Clibu Web Clipper which enables you to capture content from Web pages. 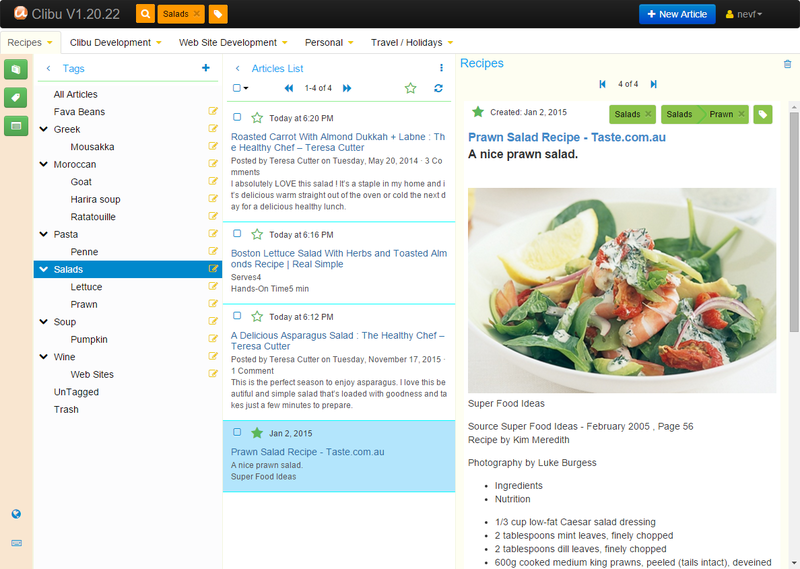 You select the Knowledge Base to use, add appropriate tags or create new ones, add your own notes and go. 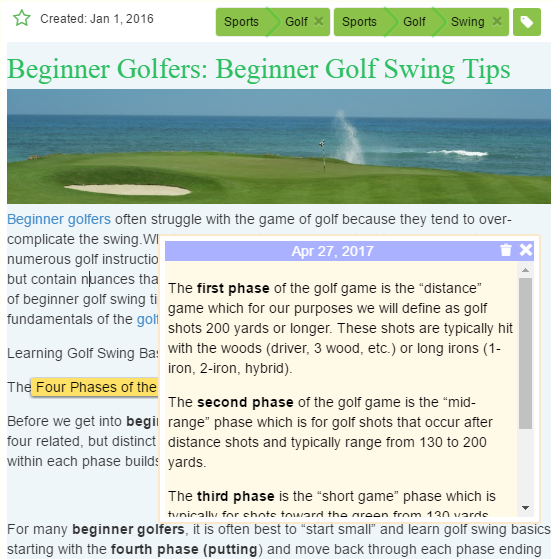 The Web Browser context menu lets you create a new article with selected content, create an article bookmarking the page and append selected content or a bookmark to the current article. Another option is to send content in an email to Clibu, which in turn creates a new article. The target knowledge base and tags can be included in the email. All articles can be edited, images added, content pasted from other applications like Word Documents, PDF’s, Web pages etc. 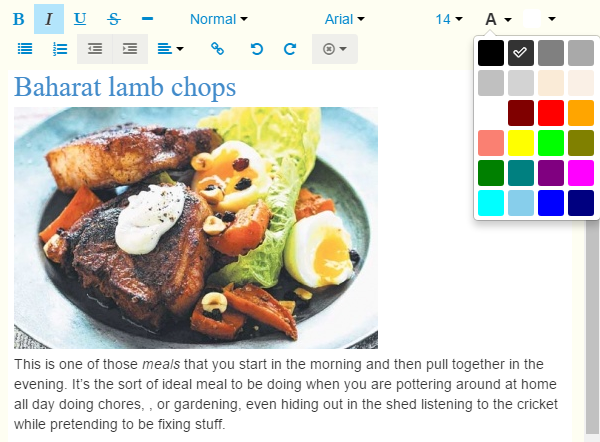 Use Clibu to create rich text notes with images and edit information clipped from Web pages. Create headings, quotes, lists, code blocks, insert horizontal lines, set font style, size and colors, bold, italic, underline and strikethrough. Create ‘See Also’ style links to other Clibu articles to build a graph of related content. These connections make it easy to follow information from one article to the next. Create links to external Web pages. Create Tags from selected text. Copy and Paste text and images from other applications into Clibu articles. There is little point building a comprehensive set of knowledge if you can’t find what you are looking for. Clibu’s Tags Filter and Tags Tree deliver just the articles you want, in a snap. Tags enable you to put articles into pigeon holes, so you can instantly retrieve them. However unlike other products, Clibu empowers you with nested or hierarchical tags. So instead of lumping all articles about Cars into a ‘Cars’ tag, you can have ‘Cars / Toyota’, ‘Cars / Porsche’, ‘Cars / Porsche / Cayenne’ etc. Articles can have multiple tags, so a Car article could have ‘Cars / Porsche’ and ‘Tires / Pirelli’ tags, making them even easier to find. Tags can be instantly renamed and moved around in the hierarchical tree via. the tags menu shown. Of course Clibu also has full text search. Plus the ability to navigate collections of related articles via. ‘See Also’ links, even across Knowledge Bases. Finally important articles can be flagged with a Star so you can drill down and just see starred articles which match the current tags or search query. Clibu enables you to add pop-up notes or annotations in articles as shown here. Annotations are a great way to include information which is hidden away until you need it, decluttering the main article content. To create a annotation highlight the text to associate with it and click the ‘Create an Annotation’ button on the floating toolbar. Annotations are hidden by clicking the x close button and shown by clicking their highlighted trigger text. If you are looking for a better way to collect, use, manage and share information then you should sign up now and benefit from all Clibu has to offer. Go to myclibu.com click on the Signup button at top right, enter your E-mail address and we will send you a Login password, so you can use Clibu straight away. Clibu is completely free at this time. At some point we’ll charge - if you can afford a cup of coffee a month you’ll be able to afford to use Clibu. How good is that. Clibu works with modern Web Browsers including Google Chrome, Firefox and Microsoft Edge. It does not work with Internet Explorer. The Clibu Web Clipper is available for Chrome. We have also developed it for Firefox, but are unable to release it at present. Soft As It Gets Pty Ltd has been developing and publishing software for over 25 years and has an enviable track record of producing quality software that people love to use. Soft As It Gets Pty Ltd. Copyright (c) 2014 - 2018, Soft As It Gets Pty Ltd; all rights reserved.